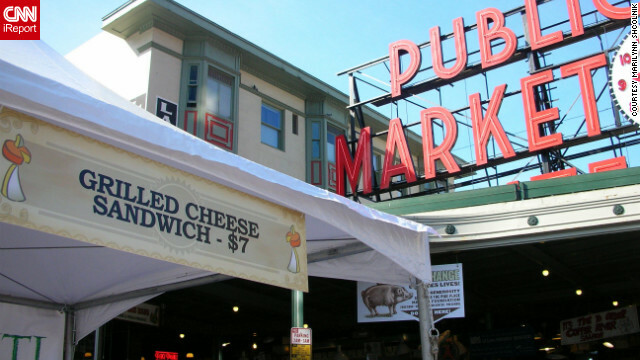 CNN's Ashley Preskar says Seattle's Pike Place Market is much more than your ordinary farmers market. Watch out for the flying fish! Editor's note: This piece is part of a series of "city smackdowns" pitting rival cities against each other and letting you decide which one's best. Check back Thursday for an equally passionate argument for Portland, then visit CNN iReport to defend your city of choice! (CNN) -- Two weeks ago, I flew back to Seattle from Atlanta. Immediately after stepping off the plane, I could feel it: home. The fresh air hits you like a freight train. Technology is everywhere. Hipsters ironically drink coffee. Recycling bins span as far as the eye can see -- and I hadn't even left the airport yet. Driving into Seattle is like floating through a dream: mountains to the right, glistening water to the left. Hands down, Seattle is the most gorgeous city in America (I may be slightly biased). Yes, we do get a little bit of rain -- an average of 155 days a year, if you want to get specific -- but when the sun comes out, you can see why Seattle is called the Emerald City. They're the pearls of the Pacific Northwest. Which city wins? First off, have you checked out our needle? At its highest point, the Space Needle reaches 605 feet. From the observation deck, you can enjoy stunning views of the mountains, Puget Sound and the Seattle skyline. Grab some fresh seafood from the SkyCity revolving restaurant while taking in the landscape. Now, Portland, we think your Mount Hood is adorable, but come on: Mount Rainier is punch-you-in-the-face awe-inspiring. This 14,000-foot volcano isn't just pretty to look at; it's also is an outdoor enthusiast's dream. In Seattle, you are just 54 miles from skiing, rock climbing, camping and hiking. For the not faint of heart, the Wonderland Trail in Mount Rainier National Park circumnavigates the mountain and takes an average of 10 to 14 days to complete. If water is your thing, Seattle is nestled between Puget Sound and Lake Union. Take a ferry ride out to one of the numerous islands scattered through the sound. Or, if you prefer, a 45-minute boat ride will land you in Tillicum Village on Blake Island, where you can dine on a traditional Native American salmon bake followed by a cultural show inspired by the Coast Salish tribes. Seattle is the birthplace of grunge. Nirvana, Pearl Jam and Soundgarden spawned an entire era of flannel shirts, unkempt facial hair and teen angst. But the music roots run deeper here. Hey Portland, have you heard of Seattle native Jimi Hendrix? If you care to pay your respects to the iconic 1960s rock star, you can take a short drive to Greenwood Memorial Park in Renton, Washington. To further educate you on music, the Experience Music Project is a must-see Seattle attraction. The eye-catching building, designed by Frank Gehry, houses numerous music exhibitions, an interactive sound lab and a state of the art concert venue. Guitar enthusiasts will particularly enjoy Guitar Gallery: The Quest for Volume. If you care to hear some live music, Bumbershoot, the yearly outdoor music festival, is guaranteed to satisfy your ears. Or, for a year-round affair, stop on by Neumos Crystal Ball Reading Room to sample some awesome punk and indie rock music. Want to see fish fly? Stop on by Pike Place Market and make sure to look out for a Copper River Salmon flying over your head. The fishmongers at the world-famous market are skilled in the art of tossing fish ordered by customers. Pike Place Market was founded in 1907 and is one of the oldest open-air, public farmers markets in the United States. But there's more to this market than just the amazing, locally grown food. Wonderful restaurants, unique shops, the Seattle Aquarium and eccentric buskers really make the trip down to Elliott Bay worth your while. And if you're wiped out from all that shopping, walk across the street to the original Starbucks to grab some java. Speaking of coffee, did I mention that Juan Valdez has a time share here? You can't swing a laptop in this town without hitting a coffee stand that features tons of flavors, roasts and a plethora of options for the caffeine junkie. Sorry Portland, but as much as we love our sister to the south, the fact is that Seattle has everything we could want and more. Between the atmosphere, Bill Gates and parks bursting with greenery, it really is the gem of the Pacific Northwest.